“Marginless will bring the good old times where individuals will have an opportunity to place a wager against other people directly on almost any sport or other activity. Friends, colleagues and many other sports lovers will be able to get back the control of their bets and place them against a real person. Cleverly developed algorithms seem to rule today’s betting industry, however, the decentralized approach of newly forming blockchain technology based solutions will change the way we live - making financial transactions, buying products and... betting. At Marginless you can not only bet on sports, but create your own bets in different kind of niches.” - says Marginless CEO Lukas Jonaitis. Marginless is a betting exchange and a social betting network, where all users can share their betting insights, create their own markets, place bets against their friends or oppositors without being overcharged or simply tricked. Marginless will guarantee quick payouts with industry leading, lowest fees. No more worries about bookmakers adjusting your bets or not paying out your winnings due to hidden rules or/and regulations. Marginless platform works with MRS Utility Tokens only, which means that in the whole betting process, Fiat currency is not used at all. With that, KYC procedure becomes really user-friendly and simple. Platform will also offer a simplified registration and will not centrally store any of your personal data. The use of Tokens and AltCoins as a reward for betting gives you a complete, secure and lightning fast reward payment in Tokens or AltCoins. Blockchain lets you confirm payouts immediately and payouts will be processed in a couple of minutes depending on what kind of AltCoin as a payout option is chosen. Our wallet lets you keep your betting assets in more than 30 different AltCoins. You will have a possibility to deposit or withdraw AltCoins as well. 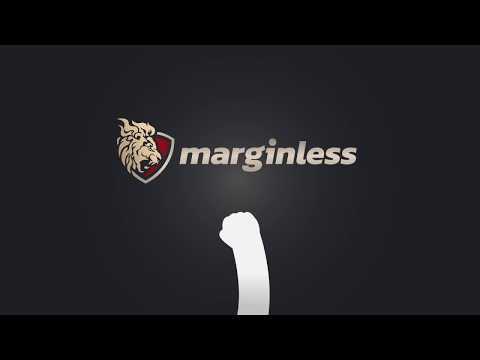 Marginless partners will integrate a possibility to purchase AltCoins or Tokens directly from our Marginless platform in a safe and quick environment. The team looks energetic. More evolution at economy model and leveraging of blockchain will increase the attraction of the project. The product and its industry has inherent challenges that may hinder growth of this product. No reputable or blockchain experienced advisor/team member. There are members, many infact, but not with successful history. The team doesn't look like it has the experience to execute on this and would need substantially more partnerships to execute on this. Would have liked to see milestones going beyond 1 year from now. The very aim of Marginless is to bring betting activity to mainstream society and to take it from the pastime activity that it has come to be viewed as. The use of advanced algorithms that ensure its decentralized control not only makes it easy to manage but would bring with it the added transparency in operations. Integrated from the very start of the platform is the blockchain technologies that ensure easy compliance with the regulatory system. With Marginless it is possible to undertake spread betting which would normally have been hard to understand due to the complex nature of the very activity. There needs to be a sustained effort to bring in a better acceptance to the system and success simply cannot be taken for granted. The team is light on experience, but I give them credit for their clear communication of their vision and strategy. They don't have a working product and will the beta is not scheduled to be released until the end of Q3 2018. This rating was provided based on the information available information at the time of the evaluation. This is not investment advice or a recommendation to invest in this or any other ICO. Investment decisions should not be made based upon ratings, but upon performing your own research. Personally I believe that the project could improve its industry market with the power of blockchain, let's see in the next future how it will be implemented. In my opinion, your reaching for too many things at once. I believe that businesses that create a niche can create more value than trying to conquer the world at once. Granted the platform may handle multiple bets, on various different sports or bets, I think its a bit all over the place. White paper reminds me of an infomercial at night. I also believe that you need to consider believing in KYC's a bit more, and AML procedures. Regular bookmakers have a really strict KYC procedure which can become problematic, especially if they requested it after the bettors wish to withdraw their winnings. In most cases, bookmakers allow users to deposit money without any restrictions or KYC procedures, but require to complete them before you can withdraw money. It can take days or even months until bettor manages to gather all required documents and get them accepted, while their winnings are stuck in bookmakers wallet. Also, all of the personal data that was sent for identification is always at risk while using regular bookmakers - regular cyber-attacks or bookmakers sharing your data with their partners." Excellent team, the right vision, the product is excellent! Sorry but it looks quite poor for now, i recommend to improve your team and advisory board list, think about business dev and product features. Good luck. Idea is interesting but the notion of a betting ICO might run into issues with regulations as it could be used as a platform of gambling (illegal in nature) and also classify this as security token under certain regulations. Betting or gambling project tend to do well and there have been several before this, good luck with the project. Great idea - a decentralised betting platform. Concerning lack of experience in any industry let alone blockchain or gambling from the C-suite. The description of the product in the white paper is about the same length as their explanation of a luxury car giveaway. I'm feeling a few red flags for this project. Peer to Peer betting is a nice idea, I just worry that the Blockchain isn't ready for it yet..
Biggest concern is how competitive the traditional sports betting industry is, particularly with nothing added to the old way of doing things all that revolutionary. Tough space to compete in without really flipping the game on its head. Idea of a social betting network, where bettors can share their insights, track their stats and earn money for doing so was born. TipstersHub Beta launched in January 2016 and quickly became the most popular betting social platform in Baltic countries. After working with hundreds of bettors, our team has made a list of main issues they face every day and possible solutions. Preparations for project launch began. FIRST SEED INJECTIONS (150K $). Received first seed injections from various Angel Investors and team members. START OF OUR NEGOTIATIONS WITH DIFFERENT DEVELOPMENT PARTNERS. Negotiations with international companies with previous experience in this market began. Several new team members and endorsers joined team Marginless. A 24 hour round that will offer a bigger bonuses to those who have made a reservation prior to this round (-29%). First public ICO round that will be available to everyone with bonuses for early contributors. Marginless eSports teams and brand reveal. Alpha version of blockchain-based betting exchange. Winner of BMW X6 will be drawn and announced. Share your insights, follow your stats and increase your winnings by using our social betting network. Bet directly against your friends or fellow bettors. Access all main Marginless functions through your mobile phone. Official launch of platform that will change betting forever. This function will allow user, holding set amount of MRS Tokens, to open personal betting page within Marginless system where he will be able to accept bets from other bettors.